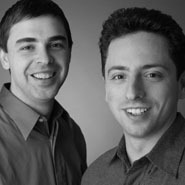 Google cofounders Sergey Brin and Larry Page launched Google, the world's largest internet company, in September 1998 from a rented garage. Since then, the company has grown to more than twenty thousand employees worldwide and is considered the most powerful brand in the world. Brin immigrated to the United States from the Soviet Union at the age of six and, after graduating from the University of Maryland, began work on a Ph.D. in computer science at Stanford University. There he met Page, who had grown up and been educated in Michigan, and they quickly became intellectual collaborators. Cramming their dorm room with computers, they used a data-mining system Brin had developed to build a superior search engine. In 2009, Forbes ranked Brin and Page the 26th richest people in the world. Both are devoted to making the world's information universally accessible and useful.